For the New York Yankees, there is no time like the present. With a 'win-now' edict superseding the desire to develop and cultivate prospects, the team awarded over $500 million in contracts to veterans this winter. The latest expenditure, Brett Gardner's four-year, $52 million extension, guaranteed a vital cog in New York's outfield for years to come. Coupled with the free-agent acquisitions of Carlos Beltran and Jacoby Ellsbury, Yankees general manager Brian Cashman has an entire outfield signed through at least the 2016 season. With Alfonso Soriano and Ichiro Suzuki under contract through 2014, the Yankees have five 30-or-older outfielders, ranging from future Cooperstown-bound stars to MVP candidates to a homegrown success story. Of course, Gardner is that success story. 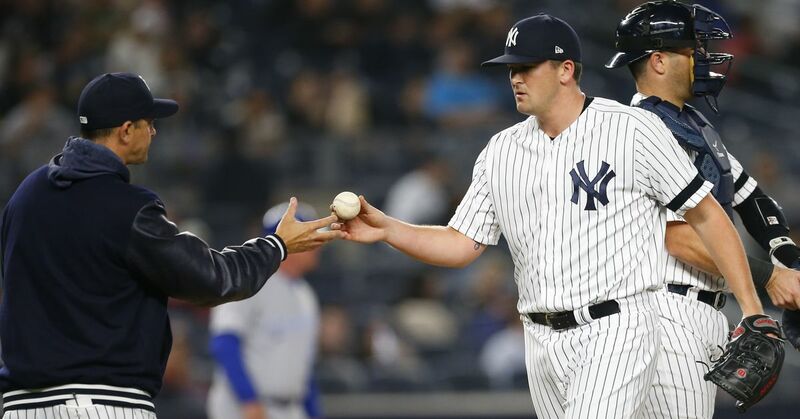 The 2005 draft pick is poised to play the bulk of his career in pinstripes after agreeing to stay in the Bronx through at least the 2018 season. Barring an unforeseen development, trade or injury issues within New York's established outfield, Gardner won't be joined by fellow Yankee draft picks Mason Williams, Slade Heathcott or Tyler Austin. Yes, the Yankees do have a farm system and outfield prospects with major league potential. Yet, due to development issues, injuries and uncertainty stemming from two decades of poor drafting, the franchise chose to allocate more than $200 million this winter on Gardner, Ellsbury and Beltran. Williams, 21, struggled after a 2013 promotion to Double-A Trenton. During a 17-game stint in the Eastern League, Williams posted a .428 OPS while sporting an ugly 1-to-18 walk-to-strikeout ratio. Austin, 22, has missed time due to injuries, crossing the 100-game plateau only once in four minor league seasons. With a career minor league on-base percentage of .387, the ability to reach base is evident, but more seasoning is needed for a true evaluation. Heathcott, 23, is the oldest of New York's top outfield prospects. He also could be the most talented of the group. Yet, due to injuries, he garnered less than 500 plate appearances in 2011-12, halting his overall progression. At some point, Williams, Heathcott and Austin all could be major league outfielders. That sentiment was shared by fellow Bleacher Report MLB Lead Writer Adam Wells. "All three have talent that will play at the MLB level, but with no consistency in performance and injuries piling up, the Yankees had no choice but to do what they did," Wells said. Mike Rosenbaum, Bleacher Report's prospects guru, doesn't foresee a scenario where any of the three become major parts of a future Yankees roster. "The only reason one of the aforementioned outfielders would see time in the major leagues anytime soon is in the event of an injury. However, even in that scenario, the organization is more likely to target an external replacement rather than gamble on the productivity of its prospects," Rosenbaum said. Clearly, the injuries and regression from this trio played a role in Cashman's offseason plan. In a perfect world, the Yankees would hand over their entire outfield alignment to homegrown stars. In New York, the farm system is closer to a disaster than anything resembling perfection. Outside of the uncertainty around the current young outfielders in the system, the Yankees have two decades of disappointment to dwell on. Since the 1994 draft, the Yankees have drafted and signed just six outfielders that went on to produce a positive WAR in Major League Baseball. Perhaps that's why Cashman was blunt in his assessment of the farm system, per Wallace Matthews and Andrew Marchand of ESPN New York. "It's not as good as we need it to be in terms of results," Cashman said. "There are a number of reasons behind that. At the end of the day, we've had some misses, without a doubt. We've had some guys who didn't make their projections, who failed to cross the finish line. So basically it's fair to criticize where we're currently sitting." To be fair, the returns have been better lately. Gardner and Austin Jackson—used in a 2009 trade to acquire Curtis Granderson—are on the cusp of becoming 20 WAR players, and 2013 first-round pick Aaron Judge is years from reaching his ceiling. Yet, two decades of drafting has netted less than a full outfield of impact performers. Unfortunately for the Yankees, the uncertainty and skepticism around their own future outfielders is a sentiment shared by rivals. In theory, the Yankees should be able to use Williams, Heathcott and Austin in future trades, perhaps as early as this summer to fill a hole in the infield. For now, expect the Yankees to trump the success story of Gardner and avoid overtures about finding the next young, cheap outfield contributor. Upon completion of the deal, Brian Cashman did just that, per Ken Davidoff of the New York Post. With Ellsbury and Gardner signed together through at least the 2018 season, the near future is very promising in the Bronx. If Beltran can stay healthy and productive in right field for the next three years, the development of outfield prospects will become a back-burner issue. At some point, New York's trio of 23-and-under outfielders will arrive at a crossroads within the organization. Without a spot open on the 40-man roster, trades could commence. Yet, if the industry doesn't drastically change its view on them over the next few years, Cashman's farm system looks poised to produce the next Nook Logan or Chris Dickerson before the next Gardner. Statistics courtesy of Baseball-Reference and FanGraphs, unless otherwise noted. All contract figures courtesy of Cot's Baseball Contracts. Arbitration numbers and projections courtesy of MLB Trade Rumors. Roster projections courtesy of MLB Depth Charts. Unless noted, quotes we obtained firsthand.